The summer solstice is an important date that only comes around once a year. In the northern hemisphere, the summer solstice is on June 21st. In the southern hemisphere the summer solstice is on December 22nd. This is because the earth tilts differently on these dates. The summer solstice is said to be the longest day of the year, the day where we get the most time between sunrise and sunset. The summer solstice is actually the first day of summer. This date isn’t just important for the calendar makers, but for people who study astrology, magic, or other rarely-used ancient arts. There are a couple of animals, plants, and other things that seem to be able to symbolize the summer solstice perfectly. In this article we will discuss how the bear, lion, sunflower, and fire represent the summer solstice, while talking about some of these symbolism on their own as well. The bear makes a great symbol for the summer solstice for many reasons. In case you didn’t already know, the bear generally mates around the end of month of June. The female bear seems to embrace the sense of the solstice more than the male bear. The female bear is more likely to watch over her cubs than the male bear is. The mating process is the main thing that makes bears symbolic of summer. This only happens about once a year. Summer is the time for new life. Sure, you plant things in spring, but you begin to see the results in the summer. In a way, the bear does a great job of representing the circle of life. When mating the bears are in the “summer” of their lives. This is why they are so symbolic meanings of the summer solstice. The lion, especially the male lion, is often said to be related to the sun’s symbolism. This makes the lion an important symbol for the summer solstice since it is usually pretty sunny and warm in the summer. Unlike the bear, the lion is representative of the summer solstice because of its looks rather than its actions. The mane of the male lion looks much like the drawings of the summer sun’s rays. The color of the lion is also orange-yellow like the sun. The female lion is also full of energy and life, also making it a great symbol for the summer solstice. If any flower was to be a symbol for the summer solstice it would make sense that it would be the sunflower. 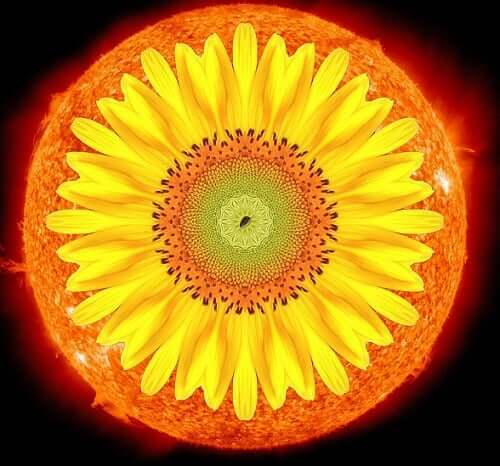 The sunflower is the color of the sun, as well as having petals that looks like the sun’s rays. One interesting thing about the sunflower is that it seems to follow the sun. The head of the sunflower always points to the sun. If you were to watch a timelapse video it would seem like the sunflower is a living animal. The earth also “follows” the sun. In a way, the whole planet is like the sunflower, and when we are directly facing the sun it is the summer solstice. Lastly, even inanimate objects can be symbolic. Of course, fire is hot just like the summer, but it also has much more meaning than just that. To make a fire you need energy, something to use as fuel. The summer is the season where people tend to do the most outdoors. Kids are playing outside and even adults can have fun at the beach. Bonfires are common at camps and beaches in the summer. Fire is symbolic of energy, fun, and passion. All these things can easily symbolize summer and the summer solstice. These are just a few examples of the things that symbolize the summer solstice. There are many other great examples of things that symbolize the summer. If you look around, you are sure to find some.